While I love chilling in my sweats and having netflix movie marathon with my hair in a bun on my head as much as the next person, I also love getting dolled up and wearing makeup! Theres’ something about putting on a full face of makeup that gives me a little boost of confidence (I wrote about this earlier in my guide to creating a productive morning routine). I’m in no way saying that you need to wear makeup, but if you’re like me, and you enjoy it – check out my current makeup favorites! 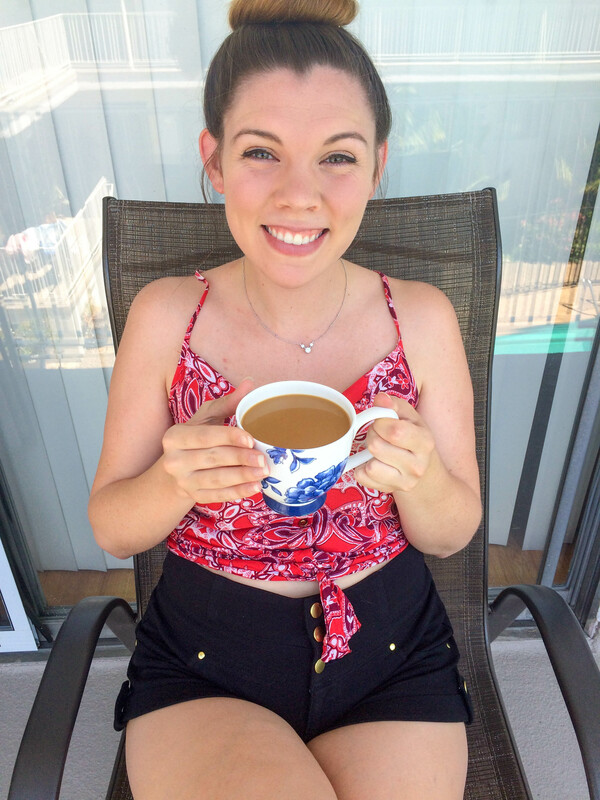 I like to keep my makeup routine fairly simple and the picture above is what my “everyday” makeup look is! This photo is from a photoshoot where I got lost exploring my own city. 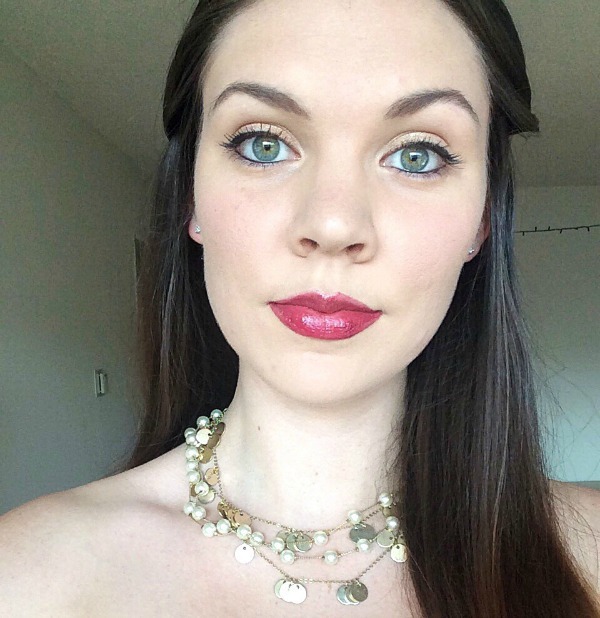 Sometimes if I’m going out somewhere fancy (like this photo from when I went to the opera recently) I’ll throw on a little more eyeliner and some lipstick – but other than that, my makeup is pretty much the same. I’ll break down the products that I’m loving the most. 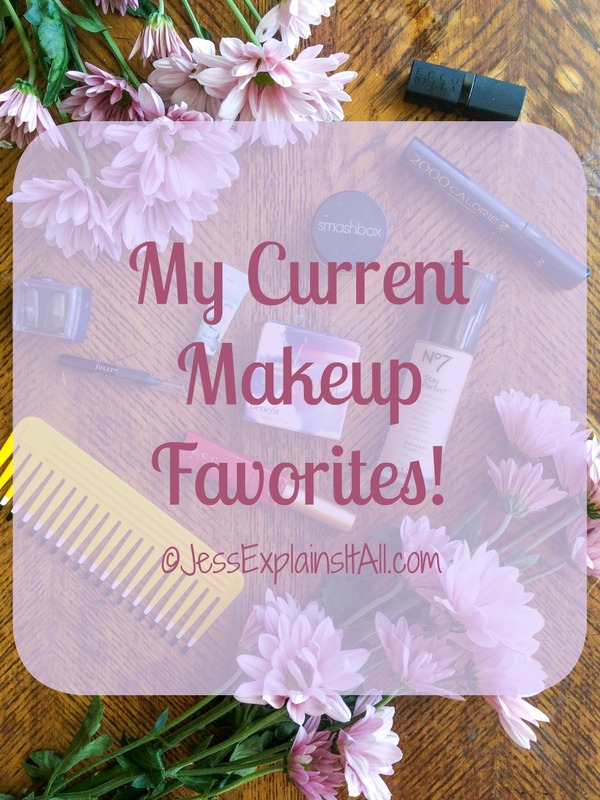 A lot of them are old favorites that I’ve had for quite a while, but there’s some new products I’m obsessed with that have made the list! Foundation: Foundation is the biggest challenge of my makeup routine. I blush all the time. Like, 24/7, every minute of my life, constantly. If I trip in public and feel embarrassed, my entire face turns as red as a tomato. If I laugh (really hard or just a little) my face turns into a tomato. If I see my boyfriend wearing a shirt that he looks super handsome in – yep, you guessed it – I’m a tomato. While I have an undying love for cooking with tomatoes I do not want to look like one. This is where my foundation favorites come in! Benefit Playsticks in ‘Spin the Bottle’ is and has been my favorite foundation since high school (not kidding). I went to the benefit counter one Christmas with my mum when i was just beginning to learn about makeup and a wonderfully sweet woman showed me the ultimate foundation for me. When I paint this on, there is NO TRACE of redness. It helped me feel much more confident in high school to not look like I was blushing all the time! This is still a favorite of mine and I use it often. I do like wearing it more in the winter though, because it’s a little heavier, and I tend to sweat more in the summer, so I like to wear something a little lighter like No7. No7 in ‘Cool Vanilla’ is my newest foundation obsession. I went to Target and a sweet girl helped me find this shade (I’m terrible at matching my own skin tone). I like this foundation because it does a good job of hiding the redness (though not as good as Benefit) and it’s super lightweight which makes it great for summer! Blush: I think that blush is essential if you’re wearing foundation. Sometimes I don’t wear foundation and just eye makeup instead – but if I do, you’ll always find me wearing blush. I find that it makes my face look more ‘lifelike’ after it’s been completely evened by the foundation. It gives a youthful glow! Benefit’s ‘Hervana’ Blush is a wonderful every day blush. I’ve had some in the past that are almost brown like bronzer! I’ve also had some that are neon pink, and while middle school Jess might have loved that, I think my tastes have changed to like something a little more…ehem…subtle. Enter, Hervana! Bobbi Brown Blush in ‘Peony’ is a fantastic special occasion blush. It’s a little more pink than my every day blush (but definitely not neon). I don’t use this as often, but love to have it for a dramatic option when I want to dress up a little! Eyeshadow: I’m so excited to be talking about eye makeup, I love using products that make my eyes pop! I have green eyes with little flecks of gold in them, so I tend to use shimmery gold shadows to bring that out. I also like neutrals, purples (they work wonders for green eyes) and even a light dusting of green. I tend to use cream shadows more, because I find that you can see the color better and they stay on better. Smashbox’s Limitless 15 Hour Wear Cream Shadow in ‘Riches’ is one of my go-to versions for gold. It’s the one I wear most often. This eyeshadow really stays put, and it has just enough shimmer to draw attention to my eyes, but not too much to be distracting. Benefit’s Creaseless Cream Shadow is amazing. It’s been a favorite of mine for a long time. I have tons of colors and my favorites are Birthday Suit, Flatter Me, Stiletto, Bronze Have More Fun and R.S.V.P. They ware slightly shimmery, and so pretty! 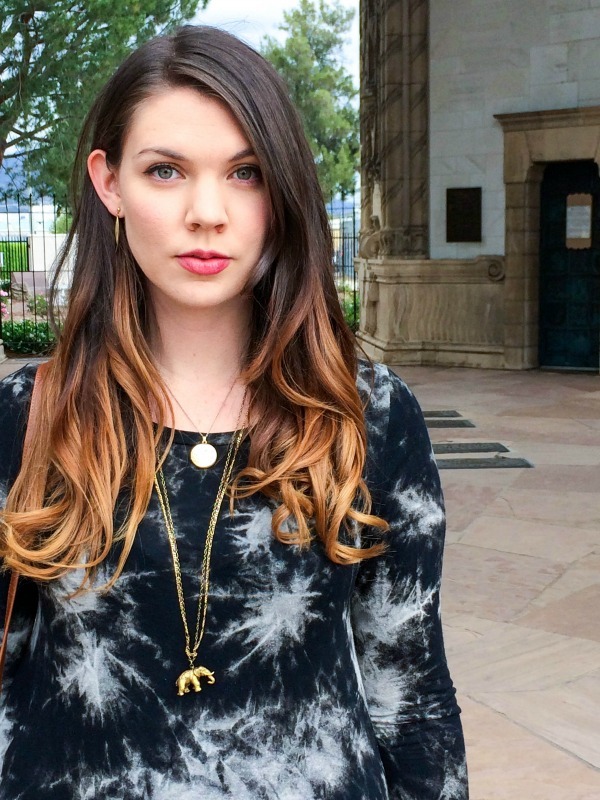 Those colors cover just about everything – neutral, purple, gold, and even a smokey eye one! Physicians Formula Shimmer Strips Custom Bronzer Blush & Eye Shadow is a cool product because it works as a shimmery eyeshadow and also a bronzer/blush. I like to dust a light layer of it over other shadows to give them a little extra glitter for a night out! Eyeliner: I feel like I’ve used every eyeliner under the sun! I’ve used the pencil, the self-sharpening crayon, liquid and gel! I like them all, but I have two that are my clear favorites. Julep’s Black Gel Eyeliner is one I found about 6 months ago and I’m o-b-s-e-s-s-e-d. It glides on so much smoother than a regular pencil (I find those have a lot of friction) but it still has the same control that a regular pencil does! It’s the best of both worlds! The biggest tip I can give for making gel eyeliner your new best friend is to use an eyeliner pencil sharpener often. The sharper the pencil, the easier to use! And trust me, the less you have to fight with eyeliner pencils – the better! Rimmel London’s Glam Eyes Liquid Eyeliner is great for precision. It took me a while to get used to it, but once I did I added it to my favorites list! I like to use this one on my top lid as close as I can get to the lash line for a natural look! Mascara: Long lashes are such a makeup goal for me (and probably the rest of the makeup wearing world). I’ve got a couple of favorites, but I generally find that I choose a mascara based off the brush instead of the actual mascara. I always go with black mascara to make them as dark as possible, and I look for a straight wide brush with lots of bristles. Max Factor’s 2000 Calorie Dramatic Volume Brush Mascara is one I’ve had for what feels like forever. My mum gave it to me ages ago and I like it for an everyday mascara. It doesn’t clump up at all like some of the less expensive mascaras, and it doesn’t irritate my eyes at all. Rimmel’s ScandalEyes Volume Flash Mascara is an amazing inexpensive option. It’s under $6, and the brush it comes with makes me feel like I have the longest lashes in town! I just started using this one a couple of weeks ago but I’m loving it. It’s a great budget mascara; it’s super cheap, but gives you great results! Lips: I love a good red lip. And a plum lip, and a wine kissed lip. Basically any lip color that is bold and dramatic is one that I’m a fan of! Ecco Bella’s Flower Color Lipstick is amazing (and it stays on forever). I worked an entire day at work without re-applying and as I was leaving my co-worker asked if I just touched up my lip color! This stuff is amazing. Plus it doesn’t dry out your lips like some other lip colors. My favorite colors so far are Merlot and REDvelation. I also love Ecco Bella’s Lipgloss. It has a lot of color that stays a long time – just like the lipsticks! I like Power and Passion the most. The glosses also go really well over the lip color, and it makes a slightly different color, so it’s almost like you get three for the price of two! I’m in love with their line! Burt’s Bees Pomegranate Lipbalm is my go-to when I don’t want to necessarily put color on but to hydrate my lips instead. BUT even though it’s more for function than for fashion, it does have a nice tint to it. I always have a tube in my purse! Dior’s Lipgloss is one of my favorites to wear to jazz up a look with a little shine but not necessarily adding lot of color. I tried this years ago and loved it. I still do! Brushes: Having a good set of brushes is just something that goes without saying when it comes to makeup. There’s specific brushes for a reason, and it’s definitely not a one-brush-fits-all kind of thing! 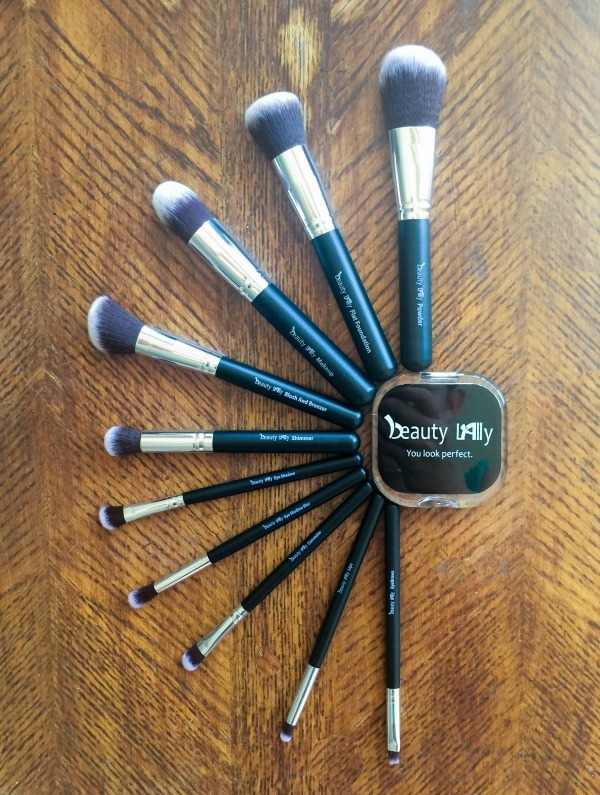 I was recently given an amazing set of brushes from Beauty Lally and that is actually what inspired me to write this post on everything beauty! I love these brushes because they have a compact case that holds them all, and each brush is labeled with it’s intended use. I’m still a bit of a makeup novice, so it’s nice to have a reminder of what goes where when they look similar to me! Plus the set comes with a magnifying mirror which is the perfect size to slip in my purse. If you’re looking to get a new set of brushes, definitely check this one out – everything you see above is less than $30! Undecided: There’s a bunch of other products I’m experimenting with while I’m trying to find the best versions, but the jury is still out on them, so I’ll have to check back in with you when I find my favorite powder, bronzer, highlighter, and eyebrow pencil. If you have any favorites of those, I’d love to know in the comments! 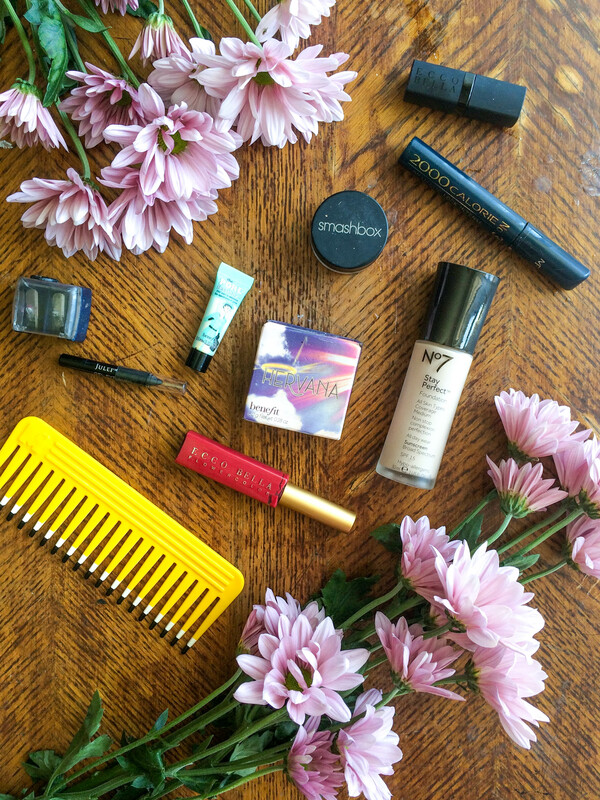 Well, there you have it – my current makeup favorites! 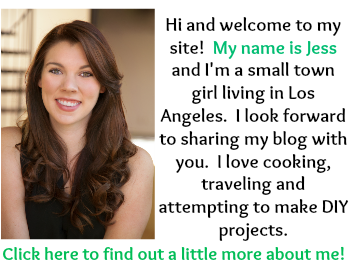 I would love to hear about any products that you’re using that you love in the comments. I’m always on the hunt for new products! 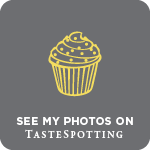 Thanks to Beauty Lally for sponsoring this post! Gorgeous, natural look! I really love that Bobbie Brown blush! It’s such a pretty pink! Thanks! I’m loving the Bobbie Brown blush too, their products are such great quality! I totally agree, blush is a must! My face just seems slightly too pristine without any color after foundation. Transforming a day look into a night look takes no time at all when you layer, which is why I love doing it so much! I love that set of brush that you are using! They look compact but vey comprehensive. Thanks Everest! They’re really great – there’s a brush for everything I need! I love both your daytime AND night time look. So different but still the same! Hahaha! It definitely took me a while to get the hang of it, but now I love it! So glad that you like the picks! I’m obsessed with them too!